Posted 4/20/2019 9:44am by The Webb Family. It always takes us about a week to gather our thoughts and transition out of a state of mind that revolves entirely around maple sugaring. It was a fast paced and grueling season. We had a late start while cold conditions and snowpack delayed the sap run. This gave us more time in the woods to fix lines and tap trees. We also continued our logging project while awaiting the weather change. 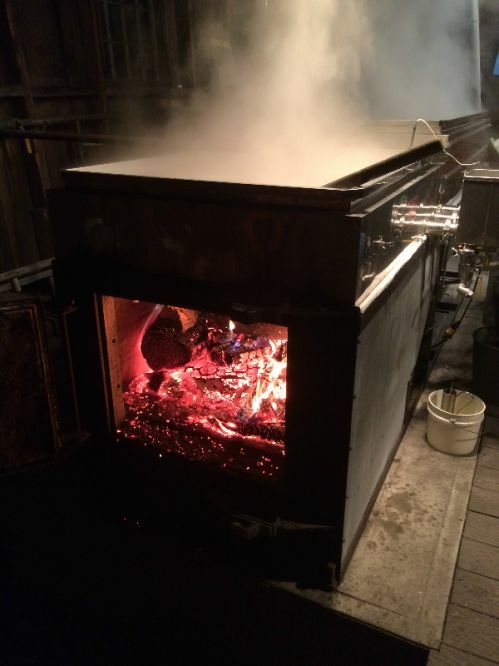 Our first boil commenced on March 15th with a Friday evening spent sweetening the pans with friends and family. We spent 24 days in the sugarhouse over a period of 30 days – with the longest consecutive stretch being 9 days without a day off. Maple weekend was successful as always, despite a surprise couple inches of snow on Saturday morning. Sunday was the better day for visitors and those that stopped by enjoyed delicious HHF beef slider samples with a drizzle of syrup. 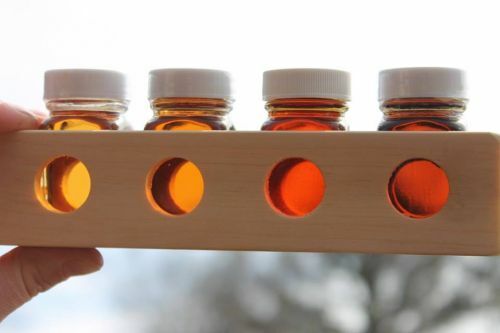 Our newest product, bourbon aged maple syrup, was enjoyed by all and certainly sold well. Don’t worry, we still have some in stock! Once again, we enjoyed every minute spent in the sugarhouse sharing the sights and smells of maple season with our visitors. 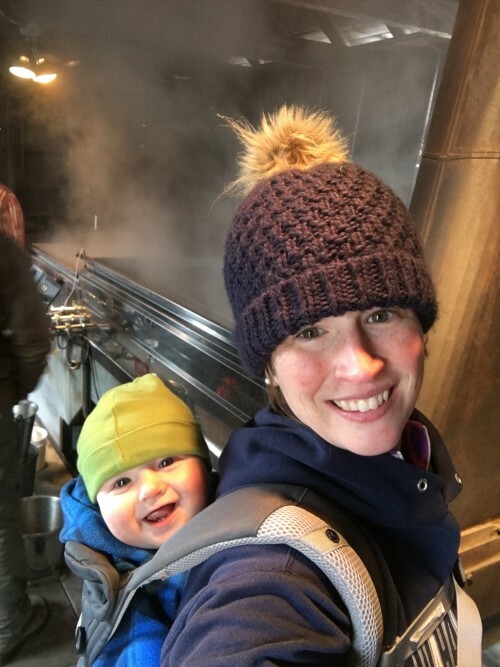 This season was truly special as we celebrated Brooks’ first sugaring season – a next generation in training. 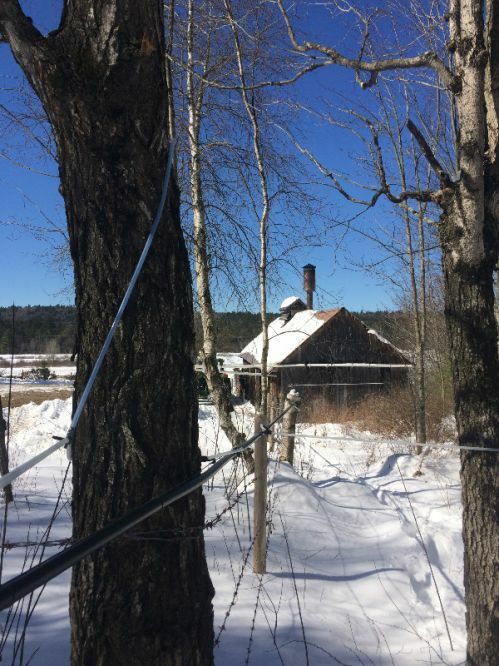 Sunapee Schools introduced maple sugaring in their third grade curriculum, and they visited us for a woods and sugarhouse tour to see modern maple syrup production in action. It was also our employee, Brendan's last maple season of his high school career. He is heading off to Paul Smith's College to study arboriculture in the fall, and we hope he'll be back to help out on weekends next year. 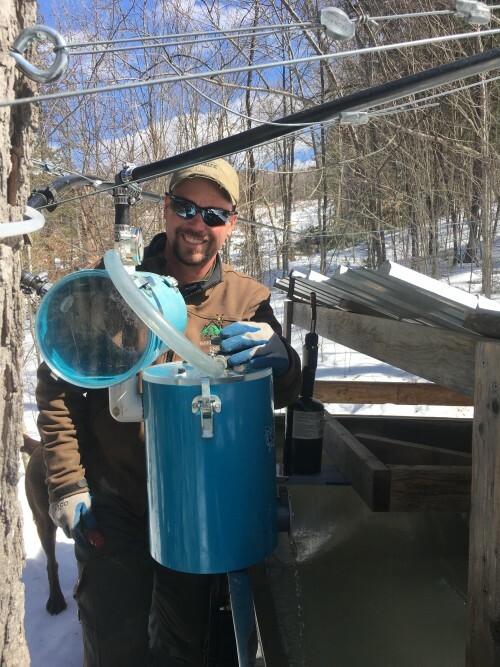 In total, we collected 26,795 gallons of maple sap this season – a significant reduction compared to the 37,675 gallons gathered in 2018. The element that saved us from a marginal season was the higher than average sugar content in the sap this year at 2.24%. 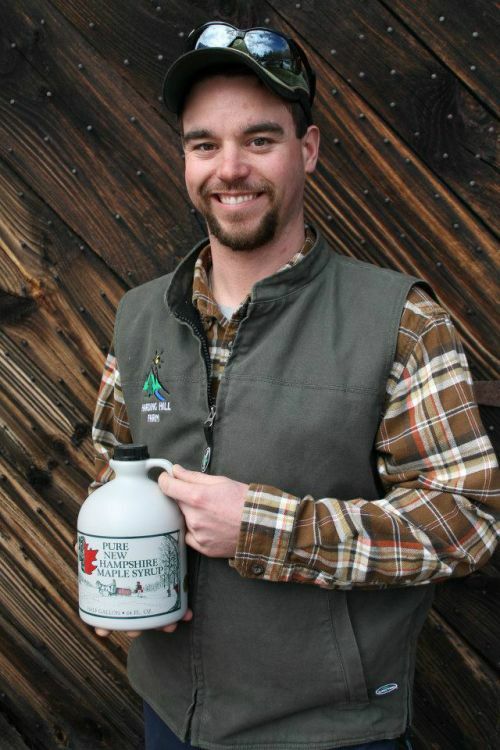 At 2.24%, it takes about 39 gallons of sap to produce 1 gallon of maple syrup. 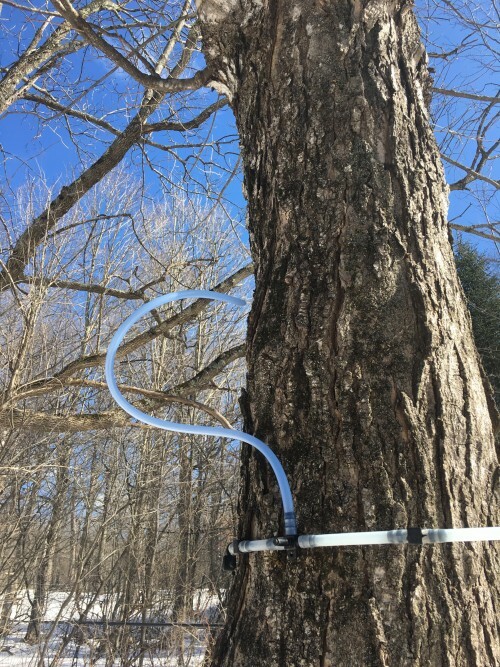 In 2018, our sap averaged only 1.64% sugar which required about 53 gallons of sap to produce 1 gallon of syrup. Quite the difference! 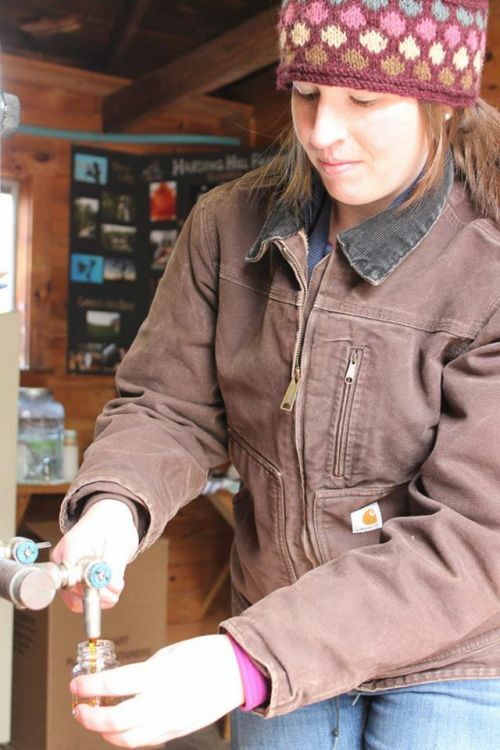 The final count for maple syrup production yield us 619 gallons of finished product. We made a lot of great tasting Amber Rich this year followed by a delicious Dark Robust. Both the Golden Delicate and the Very Dark maple grades eluded us this year. It certainly is rare not to end our season with a very dark and strong flavored syrup. Now for the BIG news we’ve been eager to share! 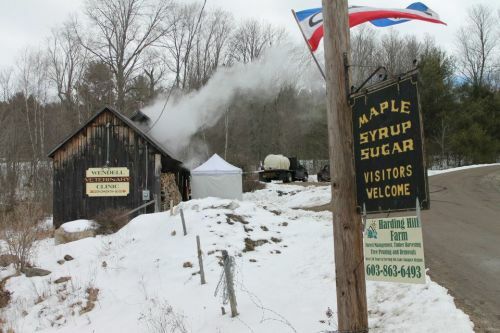 Our maple operation is MOVING to the corner of Stagecoach Road and NH Route 103 to kick off the 2020 season. The Webb family has spent 50 wonderful years in the historic sugarhouse on the Johnson family property each spring. Van often shares that some of his best memories involve sugaring in that weathered building on John Paul Flat. 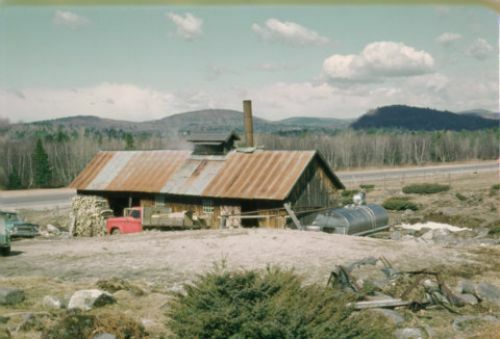 Our family is eternally grateful to enjoy a sugarhouse that carried so many stories and traditions. After much debate, we are making the big move as we construct a new building just down the road and adjacent to our own farm and forest. Our new sugarhouse will offer improved space for both sugarmakers and visitors while including as much historical charm as we can. A successful transition will take an enormous amount of support from our family, friends and customers. We certainly welcome ideas/suggestions from all as we move forward. Please follow along as we share our adventures in creating a family sugarhouse for our community to enjoy for many generations to come. Firewood - It's that time of year! We started taking orders for 2019 green firewood. Deliveries begin as soon as mud season clears up. Get your firewood order in by email or phone call as soon as possible! We sell out every year. Our price for green firewood is $255 per cord. 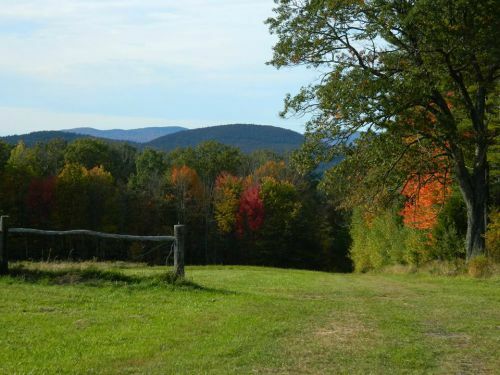 Harding Hill Farm LLC is seeking an entry-level ground person to join our tree care team on a seasonal full-time basis! 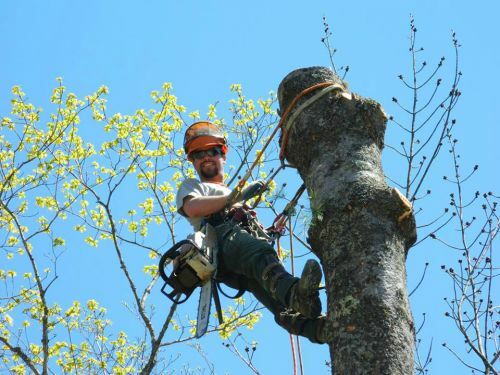 We're looking for a hard-working, reliable, and enthusiastic person to assist our certified arborist with tree care services in the Lake Sunapee region. No experience necessary. 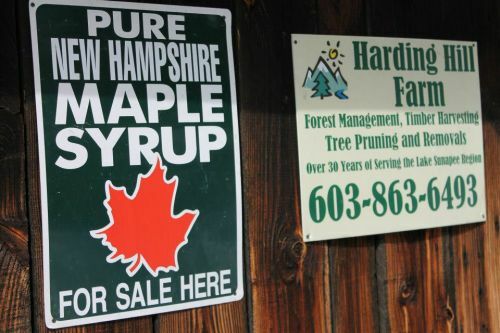 HHF is a growing and diversified tree care, farm and forestry business. The right person will have an opportunity to gain skills/experience on the farm as well. Pay is based on experience. Contact us by phone (603-504-4121) or email (hardinghillfarmnh@gmail.com). Please share this opportunity with all who may be interested in working for our family business. We're getting organized and scheduling our backlog of tree care jobs. If you're on the list, Tyler will be reaching out soon to discuss your project. We appreciate your patience after a long winter! Now that the snow has melted, you may find that you have some damaged or vulnerable trees or you're just looking to improve your view or backyard landscape. Tyler offers free consultations for all of your tree pruning, removal, cabling, and/or fertilization needs. Our family business has the skill and equipment to provide you with the safest and highest quality tree care possible. We are fully licensed, insured and will provide proof of insurance with every scheduled job upon request. 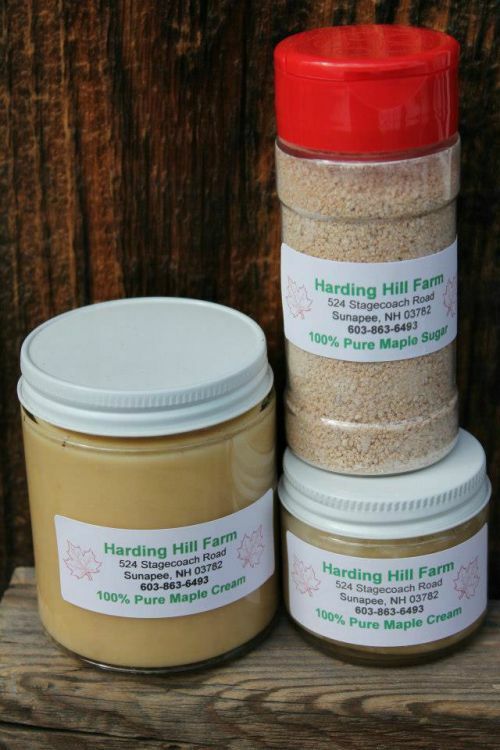 Interested in our Farm Products outside of sugaring season? Contact us year-round by email or phone, and we're happy to send you info and put together a maple syrup or beef order. 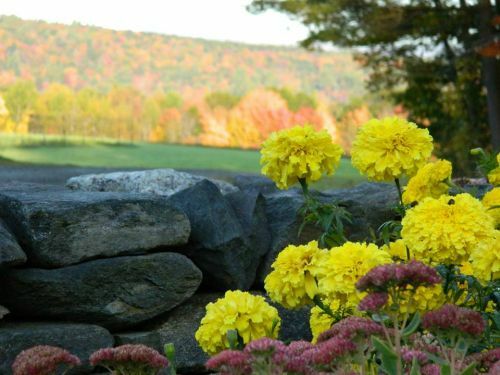 Orders can be picked up by appointment at our farm on Stagecoach Road in Sunapee. 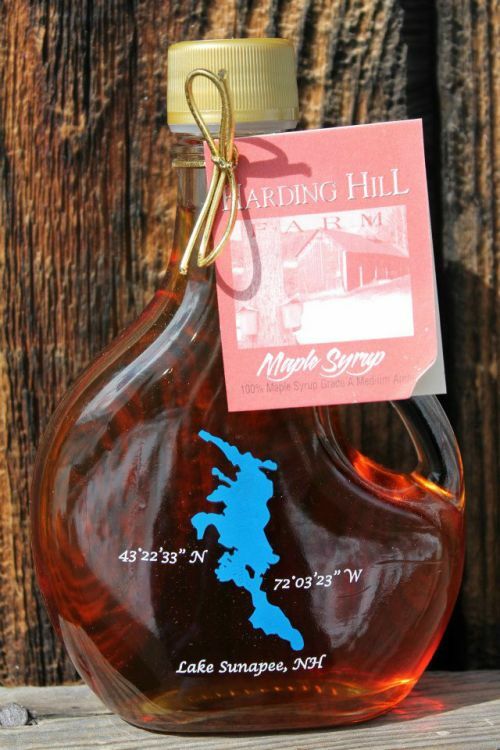 We also offer customized maple syrup bottles for weddings and special events. Contact us with your design ideas and we will provide a quote! Green pastures and spring flowers are just around the corner. Time to enjoy the longer days with a long list of spring tasks on the farm. The cows will be out to pasture some time in May and we break ground on the new sugarhouse this summer. Never a dull moment on Harding Hill Farm! Posted 3/28/2019 3:02pm by The Webb Family. We cannot thank our customers, friends, and family enough for all the support you show us each year during maple weekend! 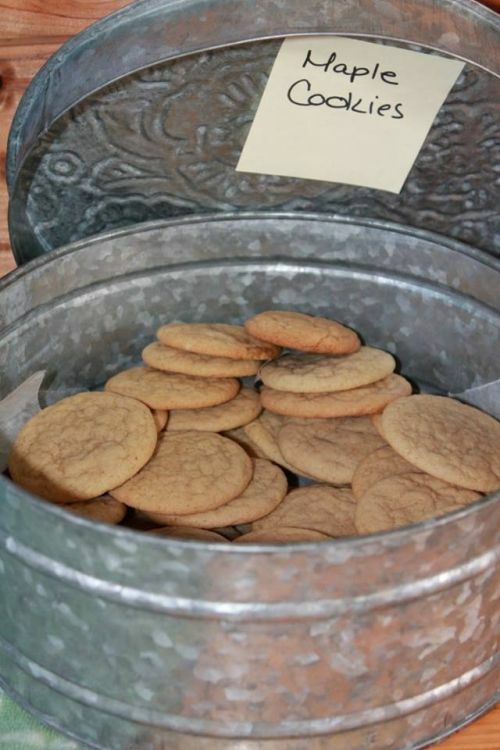 It was a weekend filled with sweet maple steam, smiling faces, and delicious treats. We hope you enjoyed it as much as we did. Our favorite part is seeing familiar faces come back year after year to our little sugarhouse. All that positivity must have rubbed off on Mother Nature because the weather for sugaring is finally here. Now onto the subject of maple grades and flavors. Currently we have a good supply of Amber Rich and Dark Robust on hand. It has been switching back and forth, but I expect we will make a Dark Robust syrup as we head into the weekend. 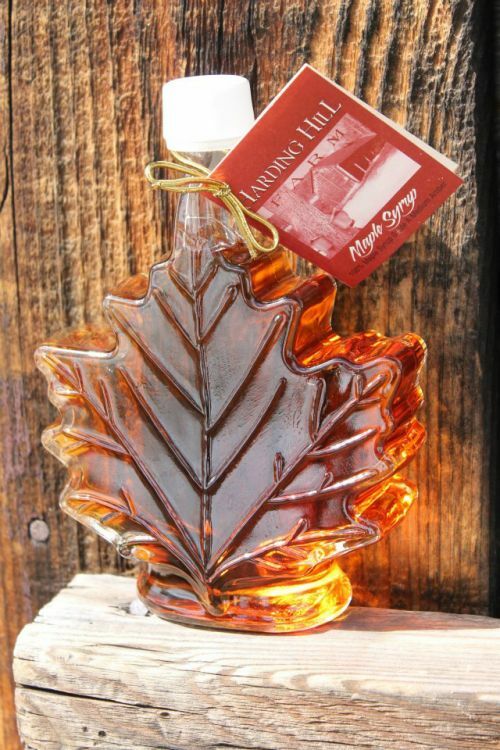 This darker syrup has excellent maple flavor - good for table syrup as well as cooking. 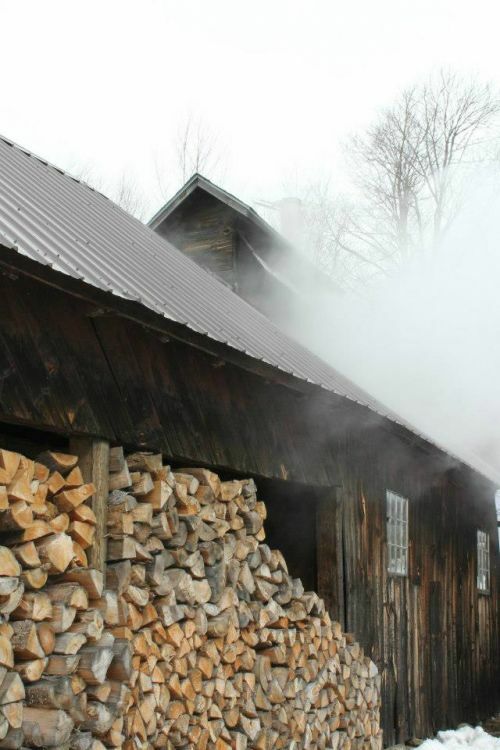 Once again, we welcome visitors this weekend to take in all the sights and smells of maple sugaring. Join us Saturday 10am till 4pm or Sunday 11am till 4pm at the sugarhouse. 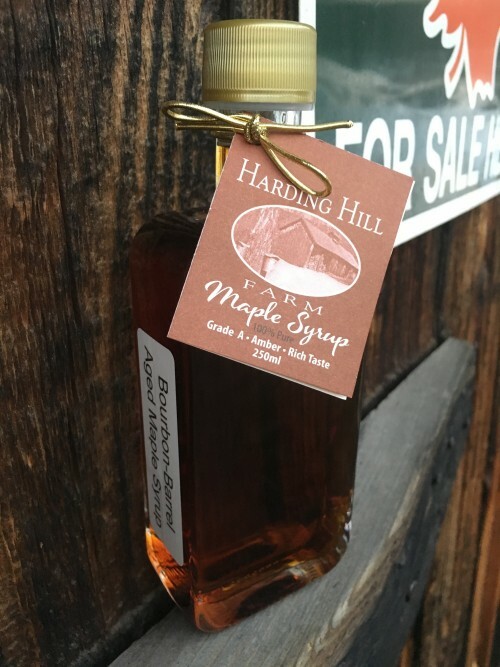 Take a tour, try some syrup fresh off the tap and check out all our farm products. 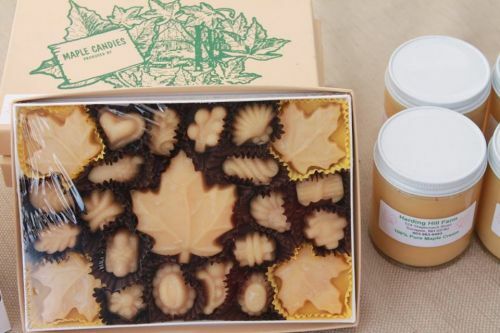 We continue to have maple syrup, candy, cream and sugar available for purchase. Don’t forget about our homegrown grass fed beef cuts too! The freezer is stocked with ground beef, chorizo sausage, steaks, and more. Stop by for a visit! Open Sugarhouse Weekends Continue - Visit Us! 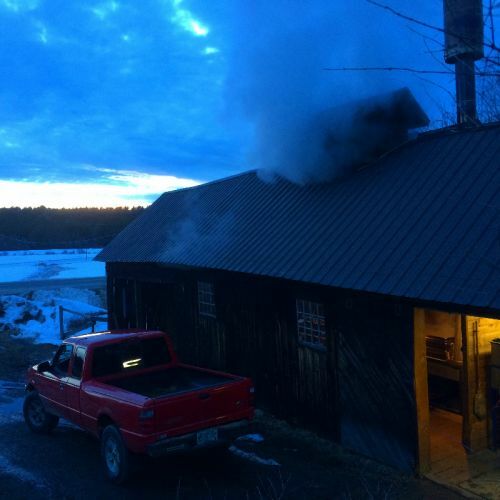 We are full steam ahead into the heart of our maple season at Harding Hill Farm. 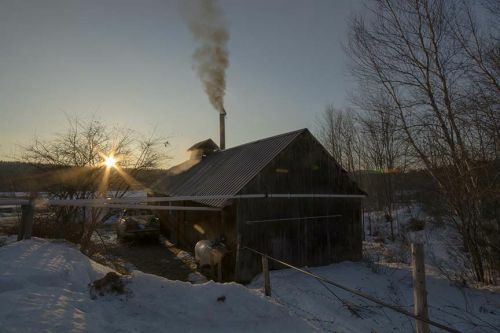 The sunshine is feeling warmer, but the cold nights must remain to keep us producing high quality maple syrup into April. Stop by before sugaring season is over - we're planning our last open sugarhouse weekend for April 6th and 7th if weather allows. Posted 3/14/2019 5:58pm by The Webb Family. The 2019 maple season is certainly keeping us on our toes. It’s hard to believe we are still waiting for Mother Nature to get her act together! While the temperatures rose above freezing several times this week, it still wasn’t quite enough to get the sap running. Lack of sun, cloudy conditions, and wind can keep temperatures in the woods colder than forecasted. The conditions did allow for a thorough walk-through as Tyler checks for leaks in the sap and vacuum lines. The sugarhouse also got some much needed TLC as we dust things off and uncover the maple equipment for the season. Today we felt temperatures into the 40s and expect 50s tomorrow with scattered rain showers. Ready or not… the season will begin. Our plan is to boil tomorrow (Friday) to sweeten the pans and stock the shelves with fresh syrup. We've got 725 gallons of sap on the truck ready for the morning. Join us on Saturday and Sunday for our first open sugarhouse event – the best kind of fun we know of. 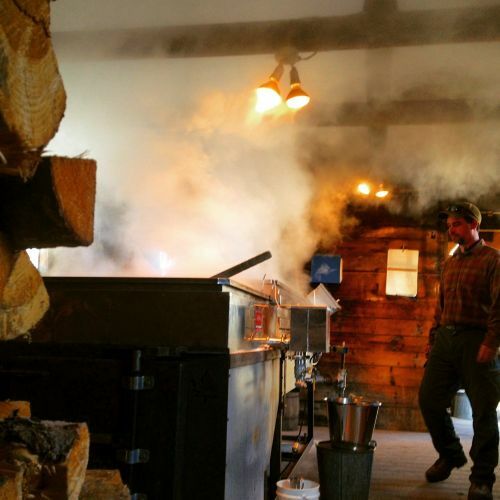 You’ll get to experience one of our first boils of the season and taste fresh maple syrup as it comes off the pans. We'll also introduce a new HHF product this weekend - bourbon barrel aged maple syrup! Its been a fun experiment and will finally be available for purchase in glass flasks and plastic jugs. Keep us in mind if you're preparing for St. Patty's Day - we have homegrown Brisket available too. The slow start to the season gave us a bit more free time than we typically expect in March. I should correct that statement, there is no such thing as free time. 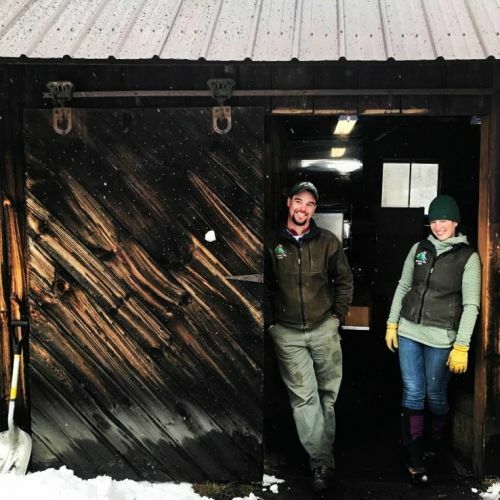 Tyler and Van continued to work on their timber harvest while also preparing the maple orchard and the sugarhouse for the much anticipated change in weather. The wait also prompted a look back on prior years. As of March 12th, 2018, we completed our 14th day of boiling with a yield of 326 gallons of maple syrup. This year, we are still stuck at zero. There’s a lot of ground to cover in a limited amount of time as we march closer to April. Please do a little sugar dance and pray the weather gods will be working in our favor soon. Our first official open house of the season! Don't miss the highlight of the season! Harding Hill Farm offers a variety of services to meet your tree care needs – pruning, cabling, fertilizing, and removals. Tyler is a certified arborist and professional logger with a forestry degree from Paul Smith’s College. He offers free consultations with recommendations, itemized estimates, and proof of insurance upon request with every job. We are thankful for a growing client base and increased demand for services in the Sunapee region. Our season for residential work starts after sugaring season (once the roads are no longer posted) and usually ends with the first snow before Christmas. Thanks to an early start to winter last November, Tyler has many carryover projects into 2019. He is currently booking out into early June. Have a potential project on your property? Do not hesitate to contact us. Attention Grass Fed Beef Fans! As always, we start the maple season with plenty of grass fed beef in the freezers. A variety of retail cuts will be available during our open house weekends. 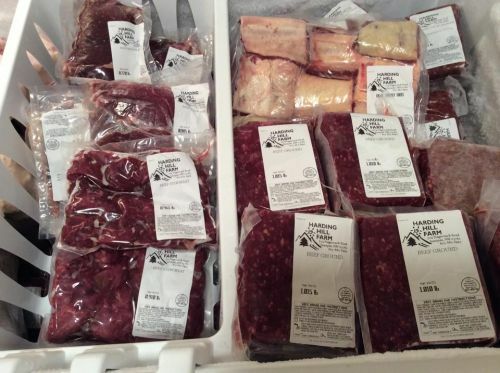 All beef cuts are USDA inspected, vacuum sealed, and frozen to assure a quality product. Have you tried our Chorizo sausage yet? It’s become one of our most popular items. 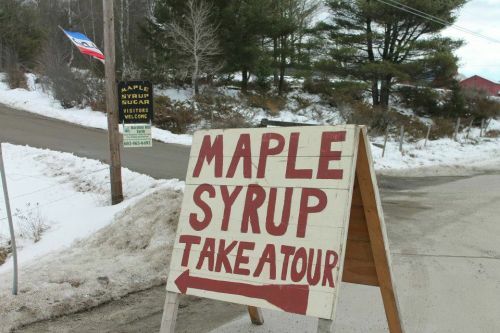 Don’t forget to show up for some delicious samples during our annual Maple Weekend celebration March 24th and 25th. Longer days, late nights, mud season, rubber boots, posted roads - yup, sugar season is here! Posted 3/8/2019 8:26am by Harding Hill Farm. Will spring EVER arrive? We continue to watch the long term forecast and hope for those 40 high/20 low temperature days that are perfect for maple sugaring. It seems late this year, but those in the industry a long time may say its right on time. 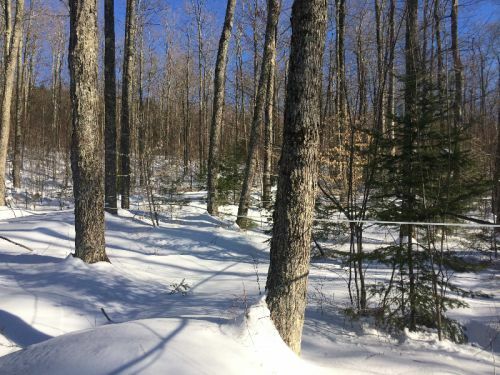 Over the last several years, sugaring has arrived early due to unseasonably warm temperatures – Feb. 20th 2018, Feb 20th 2017, and Feb 1st 2016. Those start dates made it a challenge to get our woods and sugarhouse set up for the season before the sap got ahead of us. This year is quite different. 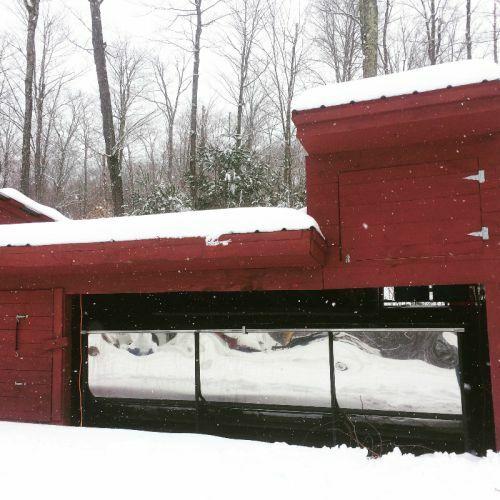 Ty has slowly prepared the sugarbush for the season – tapping over the course of several weeks. He started the process of drilling taps on Feb 13th, and we expect a total of approximately 1,300 taps again this year. While we wait, he is using the cold weather to finish up winter logging jobs while the frozen ground still allows. Check out our update ‘From the Woods’ below. With sugaring weather in the forecast next week, we are making the final preparations this weekend. It’s been quite awhile since we worked on a project in our own woods. 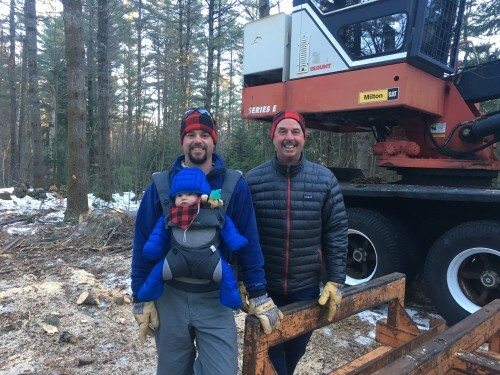 Van, within a prescribed forestry plan, managed a cut in our Webb Forest lot in Sunapee this winter with Tyler and Mike doing most of the cutting. 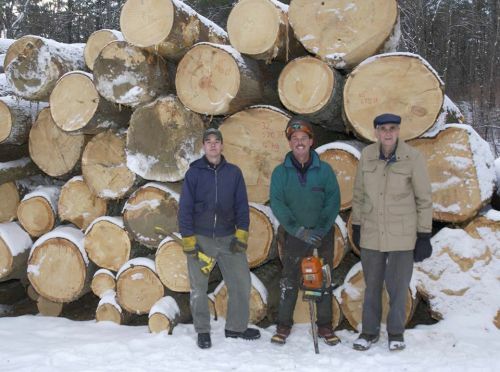 Our woods have a large and aging inventory of white pine so that was our focus. It’s becoming increasingly important to focus on these large trees before our unpredictable windy/icy weather patterns take care of business for us. In the 4 acre patch cut along the Harding Hill Rd pastures, we cut over 200 trees! We hope for a natural regeneration of oak, yellow birch and sugar maple to add to our heavy pine forest. In the meantime, wildlife will enjoy the many features that a patch cut offers. In another area, our goal was to thin out the large trees in order to release pole sized oak and make room for oak and pine to regenerate. With the ground still frozen, we continue to make progress on this project. By the end of the harvest, we should ship between 150,000 and 175,000 board feet of pine. It’s fun to look at the history in these woods. Richard Webb bought the property in 1948 and started noncommercial thinning and pruning as early as 1955. Van (son) is now making his fourth harvest in these woods and Tyler (grandson) is working on his second. 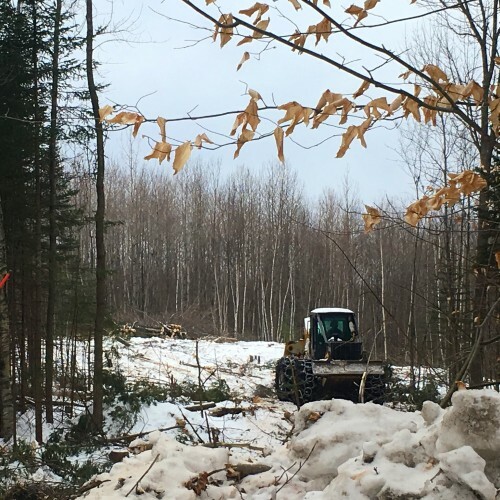 Last month, we took a break from the timber harvest to work on clearing a house lot in Sunapee for a family member. Tyler subcontracted a feller buncher to clear cut the driveway access and house lot. The woods contained early successional white birch and red maple with a diameter range of 3-8 inches. The machine cut for eight hours on a one and half acre clearing. If we cut it by hand, it would have taken us two to three weeks! Tyler took on the task of skidding out the saleable logs and chipping the rest. He brought almost 110 tons of chips to the power plant in Springfield. Not too shabby for a quick winter project. We hope to see many of you during our maple season. It’s a time of year to celebrate the winter thaw and visit with friends, family and neighbors. After a long winter, we are ready! Posted 10/17/2018 10:39am by The Webb Family. Disclaimer: I wrote this on Monday - It takes me a few days to finish a task lately! Blame it on sleep deprivation and motherhood. It’s ANOTHER rainy day on the farm. Hard to believe we started the summer with drought conditions, yet now our fields are beyond saturated and rubber boots are a requirement to stay dry. Hopefully some sunny days are in our near future. In the meantime, we adapt and make the best of a soggy day to can syrup and work on fencing. Tyler’s tree job, utilizing a crane for removals, was rightfully delayed due to the weather. It has been TOO long since my last blog/newsletter! I never anticipated how incredibly busy our year would be. As sugaring season wrapped up, we quickly changed gears to house moving. Tyler and I made the half mile move down to the main farm around May 1st. Let me tell you… moving at 7 months pregnant (even if it’s only half a mile) is not recommended! However, we are LOVING our proximity to our cow pastures and Tyler’s shorter (as if it wasn’t to begin with?) commute to work every day. Those last couple months of pregnancy slowed us down a bit since I was helping less and less with farm tasks. My due date was July 24th, and that day came and went much to my dismay. Later that week, we sat on the back deck of the farmhouse having dinner with family. Forever multi-tasking, we were all on the lookout for woodchucks… an ongoing issue around the farm. I’m sorry if this offends anyone, but we do hunt a few here and there. Trust me, the population is strong! Now picture me at nine months pregnant, just finishing dinner and watching Ty get ready for a shot. He hesitates and I stop paying attention… a few seconds later, BOOM! Needless to say, that baby kicked. Van, Robin, Tyler, and I all joked that it was a true farmer way to start my contractions. I woke up at 3:30am the following morning in early labor, HA! For the record, he got the woodchuck too. On Saturday, July 28th we welcomed our son – Brooks Richard Webb – to the family! August flew by while we were in a daze of sleep deprivation and adjusting to our new lifestyle. Brooks was a happy, healthy boy but I had a slower recovery. Ty took some extra time off to help out in those first weeks. On that note, THANK YOU to our many clients who patiently let us adapt the tree service schedule and delay some jobs as needed. 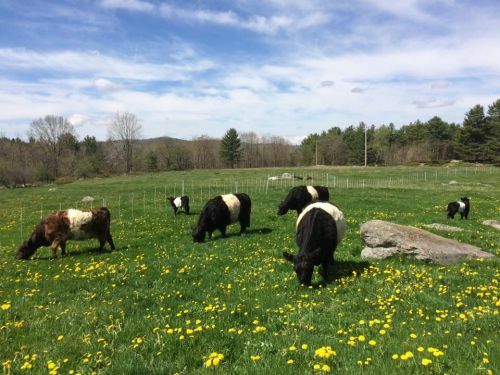 In those same weeks, we were on calf watch and welcomed four new Belted Galloways to the herd. Thank goodness for family members all willing to pitch in when needed. Van also completed a long list of infrastructure projects – upgrading several aspects of the main barn and shop barn and completing an expanded view cut across from the farmhouse. His efforts have definitely paid off! The farm is looking better than ever these days. 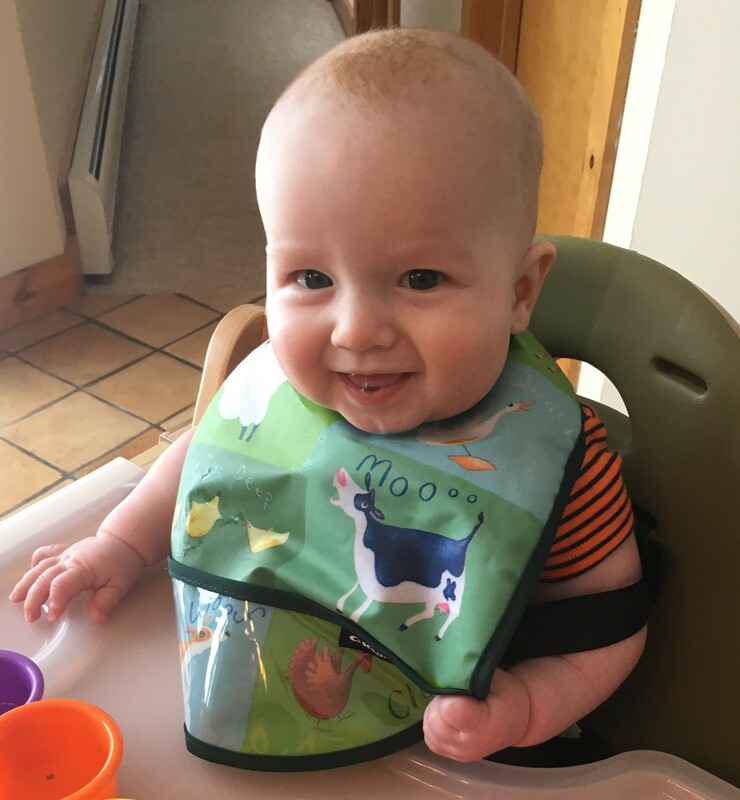 As summer came to a close and autumn began, I finally felt well enough to appreciate my time on maternity leave (from my off-farm job) with Baby Brooks and take in all the enjoyment of living on the farm. It also gave me a better vantage point to keep watch on our cow herd. Tyler resumed a normal tree service schedule, catching up on delayed jobs. Van worked diligently to finish up the haying season and continue other farmprojects. We are lucky to have a reliable, hard-working team helping us complete our tree service jobs and other tasks around the farm. We also added a small addition to our house/garage to accommodate my two horses. Norman and Bam Bam are now on the farm enjoying fall pastures and settling in to their new lifestyle as well. I’m exhausted just looking back on it all, but we truly accomplished many goals so far this year and look forward to what the future may hold. 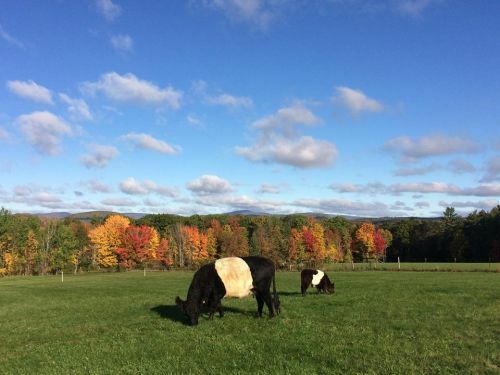 Now that we have you excited about all aspects of Harding Hill Farm, you can join in on the fun at our second annual Fall Open House Beef/Syrup Sale. We open our farm to our friends and local customers on Saturday, October 20th from 10am till 2pm. There will be brief tours of the farm, including a chance to see our cows and calves up close. In the barn, I’ll have some delicious samples to share. A wide selection of our grass fed beef cuts and maple syrup bottles will be available to purchase. As an added bonus, you may even get to meet our little farmer in training! Join us for our Fall Beef Sale Event! Our own grass fed beef and maple syrup available for purchase. I'll most likely have some delicious samples on hand too. 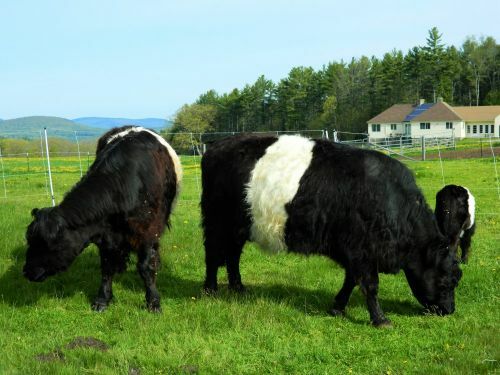 Take a tour to see our 'Oreo Cows' on fall pastures with their late summer calves. steaks, roasts, sausage, ground beef, etc. Buy at least 5 pounds of ground beef and get 50 cents off per pound. 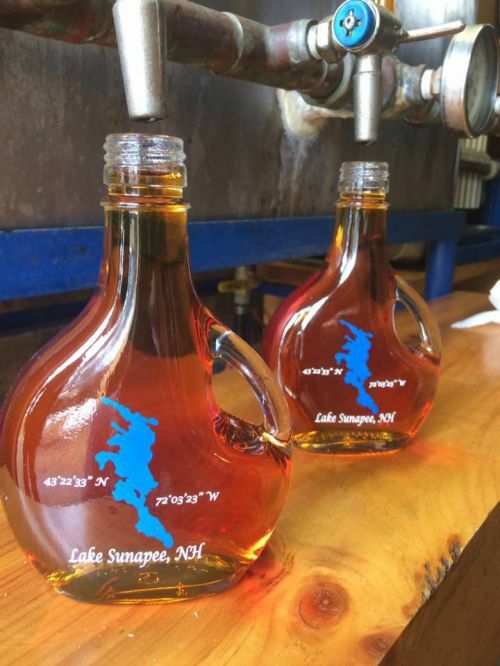 Maple Syrup available in plastic and glass containers, including our signature Lake Sunapee bottle. Contact us ahead of time for any large orders! Visit our Facebook Event to share with friends and family. Thank you again for the continued support from our customers, friends, and family. You all help us keep this farm and family business running strong. If you are on the list for tree services before the end of the year, Tyler is working diligently to schedule and complete the jobs. We appreciate your patience! Also of note since we received a lot of emails - we are out of firewood for this season. Contact us in the spring for 2019 orders. Posted 4/23/2018 8:15pm by The Webb Family. 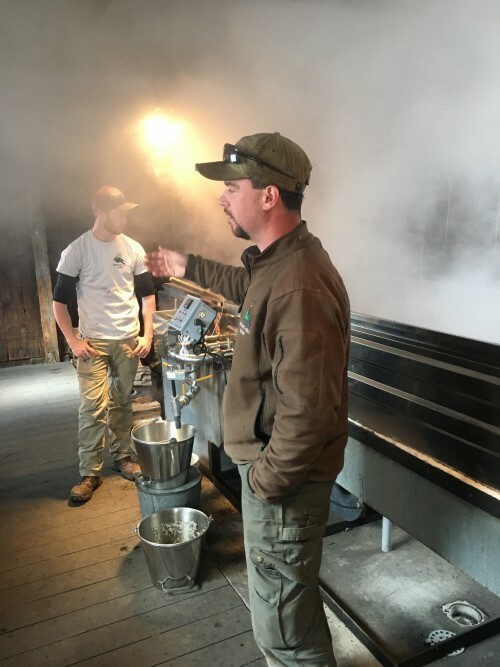 Maple Season 2018 was one for the record books at Harding Hill Farm! It has taken me a week since our last boil to find the time to write up our final post of the season. Our late ending started blending with spring activities, which led to a chaotic couple of weeks on the farm. Quite honestly, we probably could have boiled more sap… but we decided to pull the plug while we’re ahead. We finished a clean-up and final boil on Monday, April 16th with a final total *drum roll please* of 704 gallons of maple syrup!! To put it in perspective, our best record at HHF prior to 2018 was 577 gallons. We beat that record by a huge margin. It may have been higher if we counted all the maple syrup samples we handed out (or sipped ourselves) during the season. There are lot of reasons for our record year, but we will never figure out exactly what made this season so special - a bit of Mother Nature, a bit of good management, and some luck! 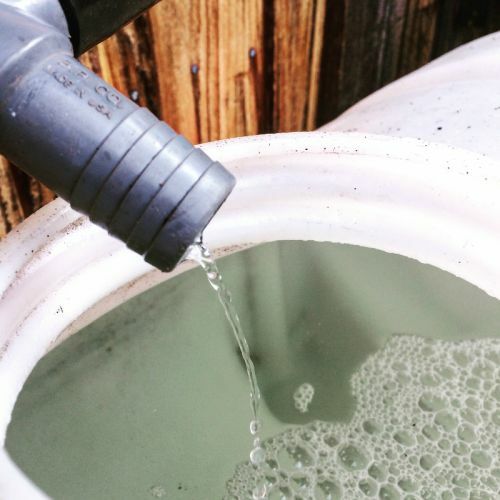 We collected 37,675 gallons of maple sap from our 1,300 taps in addition to sap gathered from friends/neighbors. 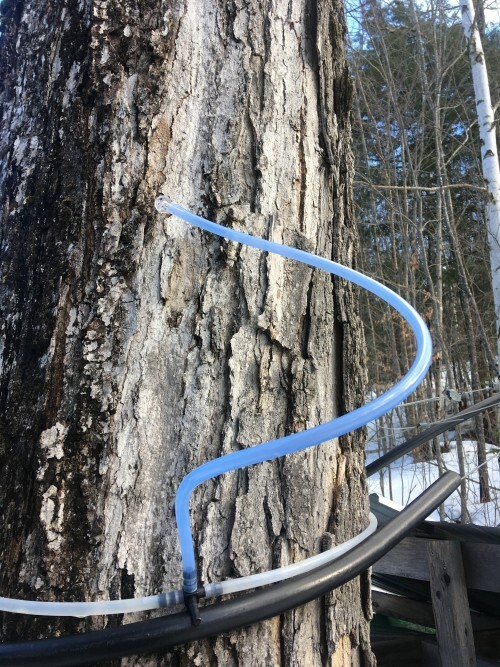 We figure our total is better compared to a 1,700 tap operation when you include the purchased sap – with that number considered, we yielded about 22.2 gallons of maple sap per tap. Overall, the sugar content of the sap was low all season but the yield made up for that difference. 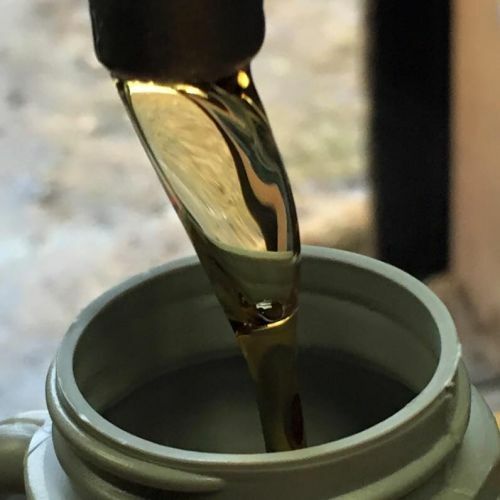 We calculate that it took an average of 53 gallons of sap to produce 1 gallon of syrup. We reached pretty far into our firewood reserves to keep the evaporator boiling into the end of the season. Tyler started tapping our maple trees on February 13th and started the first boil on February 19th. We wrapped up the season with a final boil on April 16th and began pulling taps on April 17th. After a week of clean up, we finished pulling the final taps today. Our maple grades also experienced some interesting fluctuations. 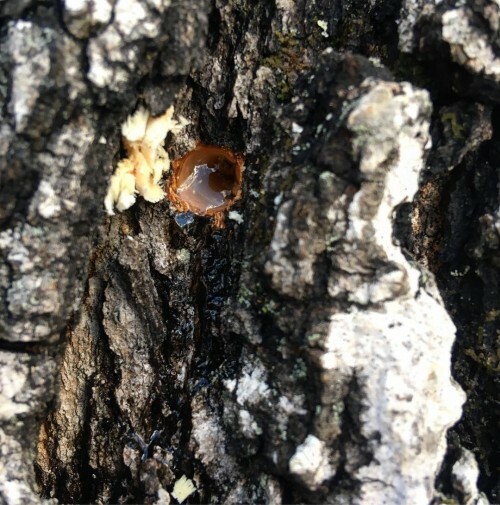 The early season syrup yielded an Amber Rich with a brief period of Dark Amber during a very warm spell in February. After a cold snap, the grade bounced back to a Golden Delicate for the first time in 4 or 5 years, yielding about 36 gallons of the light stuff. We held onto the Amber Rich grade for a couple weeks before switching to Dark for the final week of the season. I know many Dark syrup fans were disappointed by our limited supply during maple weekend. We definitely made up for it in the weeks that followed. If you’re looking for Dark syrup, feel free to email us or call for a pickup time at the farm. A big thanks to all our maple fans, friends, families, and our dedicated employee – Brendan, for making this season another success! In the last week, we juggled many spring tasks. Ty has been busy looking at tree care jobs, doing some small scale pruning, and helping with our cow pedicure day! Our cows are ready to kick up their heels as soon as the pastures green up. In other good news, our employee, Andrew, is back for another season with HHF after a winter hiatus at Mount Sunapee. He spent a lot of time in the woods over the past week pulling taps and flushing lines. Ty and Andrew wrapped up the woods work this week, and Andrew certainly has a knack for picking up all the plastic pieces we might drop in the woods. After all, we try to care for our land so it can take care of us for generations to come. Where’s Van? He’s been managing some behind the scenes items and will move into spring firewood deliveries soon. He's also looking forward to warm weather, growing hay fields, and more farm projects as we head toward the summer months. The final news to share – HHF will no longer offer a vacation rental house on the farm. Ty and I are in the process of moving into what was the spare home, previously occupied by Richard & Betsy Webb. We are excited to continue the family legacy while also keeping a closer eye on our farm critters. We hope the move makes farm life slightly easier when we introduce our new addition to the family later this summer. Ready or not, we’re expecting a baby boy at the end of July! If you visited us late in the sugaring season, you may already know that we are sold out of steaks! We do still have beef available - such as ground beef, roasts, chorizo (taco-seasoned) sausage, italian sausage, and short ribs. We will have a fresh supply of certain cuts available on Memorial Day Weekend. I'll post updates as it gets closer. Interested in bulk beef (half or whole cow)? Let us know, and I'll share the details. By the end of this month, I will contact all potential returning customers. If we have open spots after that, I will then contact customers on our waiting list. Our bulk beef is usually available between August and November. 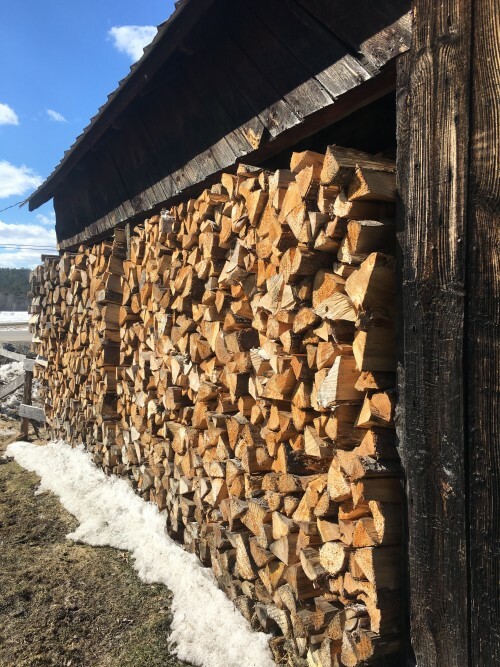 Looking for firewood to fill up your wood shed after a long cold winter? Contact us by email or phone so we can put you on our list for a firewood delivery. We have green firewood available by the cord at $225 per cord. We also have 1 year old seasoned wood available at $255 per cord. Most local deliveries are free, but contact us to check on your location. Contact Tyler, our certified arborist, for all your tree care needs! With several major storms this winter, you may find that you have some damaged or vulnerable trees or you're just looking to improve your view or backyard landscape. Tyler offers free consultations for all of your tree pruning, removal, cabling, and/or fertilization needs. Posted 3/31/2018 7:12am by Harding Hill Farm. First of all, we can't thank our supporters enough for making Maple Weekend such a success! We enjoyed sharing our farm story, teaching about all things maple, and testing out our farm products on your taste buds. We hope you had a great time with family and friends. Additionally, we had some fantastic help from our own family and friends to serve up samples, ice cream, burgers, and more. Thank you! Did you miss out on all the fun last weekend? No worries. Visit us today and tomorrow, March 31st and April 1st, for our last open sugarhouse event of the season. Its been an incredibly productive week of syrup-making with fantastic weather sticking around for the weekend. Get that last smell and taste of maple before the season is over. A bonus? We are predicting our maple grade will change over to a Dark Robust, but no promises yet. So how productive was this week? Well, this late maple update is just one result of it. Since the start of maple weekend, the sap has been running strong. In just 7 days, we made over nearly 185 gallons of maple syrup. That brings our season total to just under 570 gallons as of Friday, March 30th. We certainly would be satisfied if we made that much by the end of the season, but this year promises to keep going into April. Will we break any farm records this year? Maybe! Easter Weekend Hours - last chance to visit us! We have a variety of retail cuts available for sugaring season right at the sugarhouse. This includes ground beef, roasts, chorizo (taco-seasoned) sausage, and other delicious cuts! Please note: we are sold out of steaks! A fresh supply should be available early summer. If you have a special request or a larger order, contact us by email or phone. Interested in bulk beef (half or whole cow)? Let us know, and I'll share the details. In April, I will contact all potential returning customers. If we have open spots after that, I will then contact customers on our waiting list. Our bulk beef is usually available between August and November. Ty and Van have been working hard in the sugarhouse all week producing that liquid gold. It's been a long one for all of us, but certainly a successful season so far. It hasn't been without its surprises though - like a flat tire on the sap truck, a vacuum pump repair, and boiling till 10pm three nights in a row - but sometimes that's just life on the farm! A special thanks to Richard at Hillside Auto/Osborne's Marine for a quick fix on the pump and truck. With the weather predicted to give us sun and 50 degrees today, we look forward to seeing more visitors, friends, and family this weekend. Posted 3/22/2018 8:36am by The Webb Family. 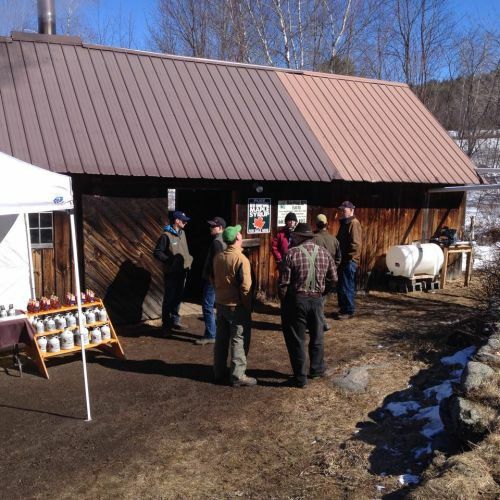 Maple Weekend at HHF is almost here! We hope you are getting as excited as we are. Our posts on social media are getting a lot of attention, and we hope that means a lot of our fans will make it to the sugarhouse for a fun weekend. 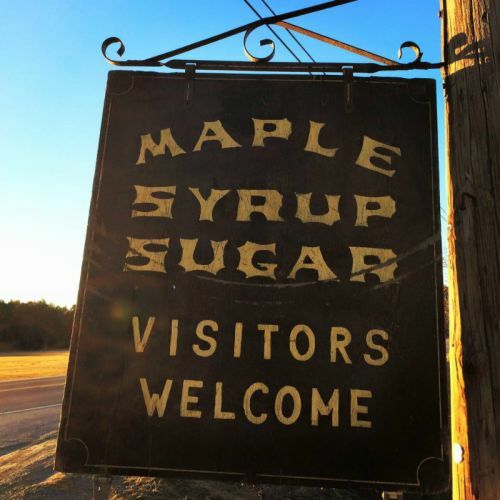 Some other big news to share - our little operation was included in this week's CNN Travel article featuring all things maple in NH and VT. It's exciting to be included with such a great group of family maple operations. We just wish we had time to go visit them all! The weather throughout the week has been less than ideal for maple syrup production. 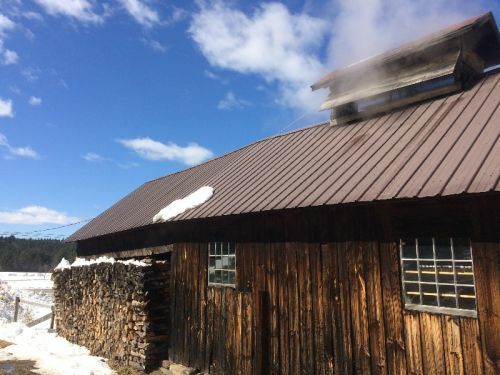 We boiled last weekend on St. Patty's day as planned, and closed up the sugarhouse for a cold, windy day on Sunday. The trees were frozen up all week, but it looks like today might be the day! Temperatures are expected to reach at least the high 30s throughout the Sunapee region for Thursday through Saturday. Keep thinking spring - so we have plenty of sap on hand for Saturday and Sunday. 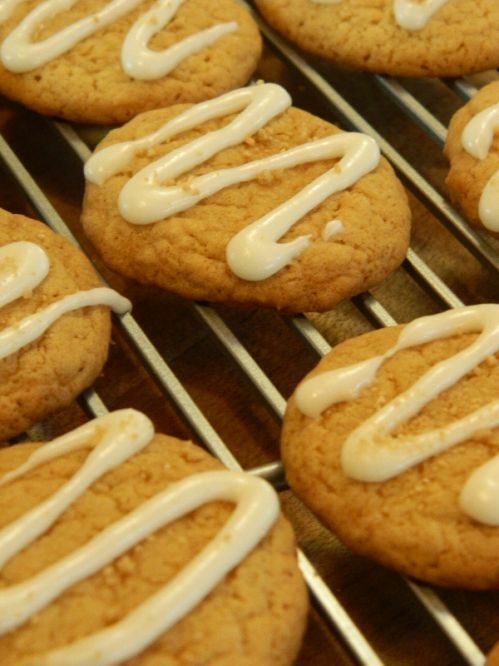 In the meantime, I'll be quite busy in the HHF kitchen preparing the ever popular maple cookies - last year I made 16 dozen! I'll also be throwing together some of our popular beef chorizo, a maple marinated roast or short rib, and ground beef sliders to be served with melted sharp cheddar and hot syrup. Are your taste buds ready yet? Not too much has changed with our maple syrup season total since my last update. We reached 341.5 gallons last Saturday! The maple grade stayed at a Golden, Delicate to wrap up the week. We'll find out this weekend what the cold snap did for our maple grade and production count. Our overall prediction is that it could be a record season for HHF! 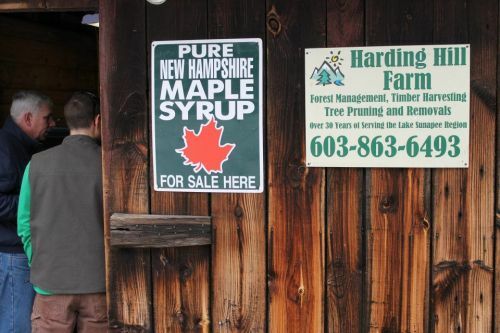 Please join us on March 24th and 25th for our annual celebration of New Hampshire Maple Weekend. Visit our Facebook Event page for all the details to share with friends and family. Also a special note: Any money received in our HHF tip jar this weekend will be donated to the Cystic Fibrosis Foundation in memory of Kelly's cousin, Heather who was an enthusiastic supporter and helper on the farm over the last several years. Can't make it out this weekend? No worries. We have a variety of retail cuts available for sugaring season right at the sugarhouse. This includes ground beef, roasts, chorizo (taco-seasoned) sausage, and a limited supply of steaks! If you have a special request or a larger order, help us out by contacting HHF ahead of time for a price list so we can prepare your order ahead of time. With the sap on hold this week, Ty and Van are back in the woods for a timber harvest amongst all our maple related errands to get ready for the weekend. We dodged the latest snow storm and the calendar says it should be spring - let's hope for those above freezing, sunny days and below freezing nights to get the maple season back into full swing!